It seems like all I have worked on this past month was “Jen”, the T.rex skull, or the Grasslands Exhibit. On occasion, I did help out a bit with ranch work. 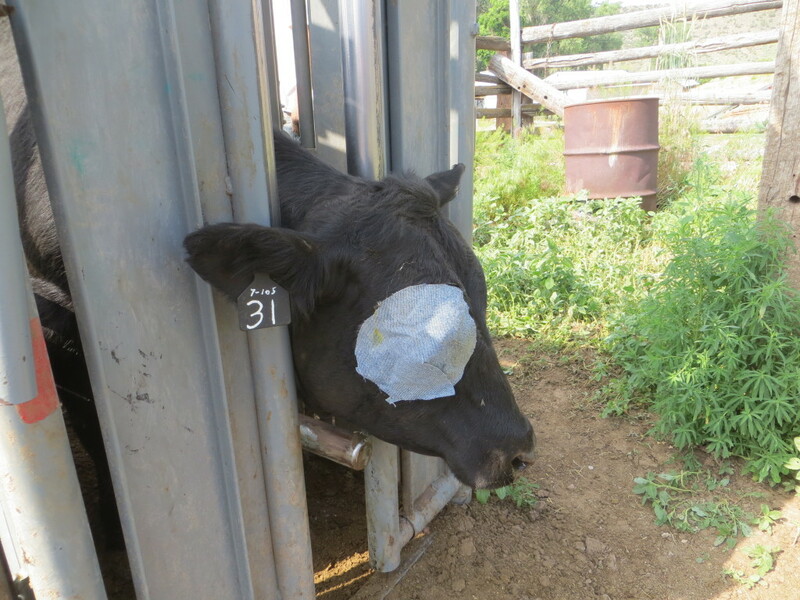 There was the morning spent bleeding our heifers. This is a pregnancy test for the heifers to see if the AI process took. That way, we’re more certain if they were bred to AI bulls or the natural ones. 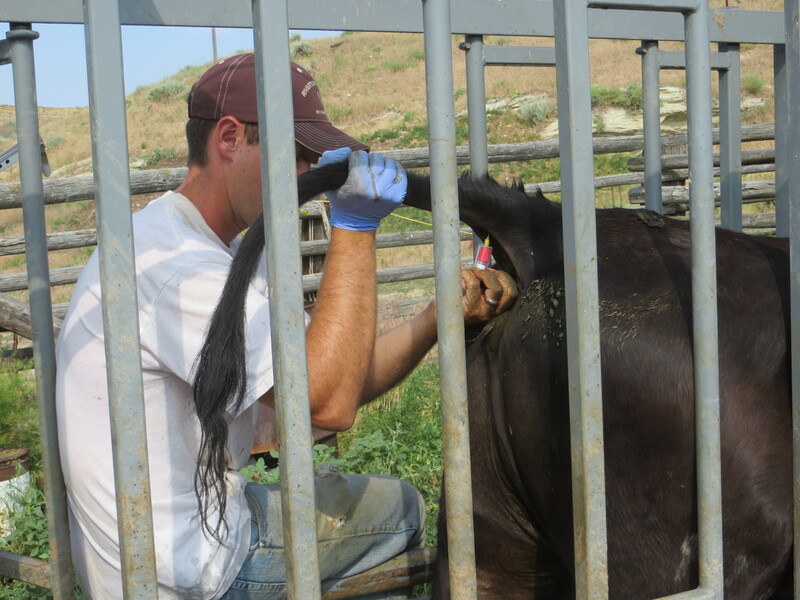 Of course, they’ll be double checked at our normal preg test time, but doing this helps with records and genetics. Brandon has improved with the bleeding part a tremendous amount… I think the first time we did this, it took us two days! This time it took us six hours. I’m just the records and labeling girl… Daniel runs the chute… and we had B. working cattle up the alley for us. We also covered an eye that may be starting with some pinkeye problems. The eye is sensitive and running, so we use old jean material to create a “cone” bandaid… keeping it protected from light, dust, and dirt. By the time the glue and patch wears off, the eye should be improved. I was out cleaning up my yard some, when Eden dropped a bedraggled, soaked, and less feathered “baby” chick in front of me. She was still alive. I don’t know if Eden was “playing” with her, or the other chickens attacked her and Eden saved her… but needless to say, I wasn’t happy! Poor little sweet thing! She really is a friendly chick, and I will be bummed if she is a he! Since she is still alive this evening, I figure she will recover. She may become a pet, I figured if she continues to get beat up by the other chickens (if that is what it was), then she can live in the chicken tractor in my garden. Her mom has gone back to living in the coop as normal. There is always plenty of work on the ranch to do! Always interesting and educational to a city girl!